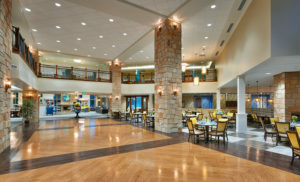 Creekside Senior Living has that “wow factor.” The entry opens to a sweeping grand hall that ends with a two-story window, perfectly framing the Wasatch Mountains and Barton Creek—a beautiful natural setting for the assisted living and memory care community in Bountiful, Utah. “We wanted to capture those amazing views as people entered the building,” said Jay Taggart, project architect and principal at Curtis Miner Architecture. The amazing views help connect residents to the outdoors—a goal of the design. 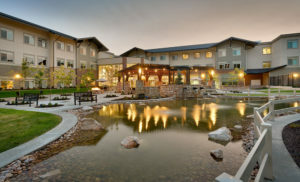 With 129 residences, Creekside Senior Living is about 10 miles north of Salt Lake City. 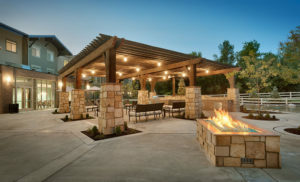 Outdoor amenities, visible from the two-story grand hall window, include features such as a plaza with a covered trellis, soft seating, and a fire pit to provide a relaxing retreat for residents. Other outdoor features include a manmade fishing pond and fountain, a putting green, and a walking path with places to pause along Barton Creek. In order to maximize outdoor green space, the building was designed with three stories instead of a two-story footprint that would have sprawled over the six-acre site. A big challenge was to meet the zoning requirements for building height. The parcel is buffered by residential developments and neighbors did not want a tall building blocking their views of the mountains. The soil was excavated so the building met height requirements. Many of the primary activity areas and dining venues are easily visible from the grand hall entrance so visitors can quickly capture the essence of the building. Indoor amenities include a state-of-the-art fitness center, salon, theater, onsite medical facilities, dining room, gathering areas, library, and private dining venues. The wide array of amenities creates destinations for the residents. A piano and stage area adjacent to the dining room provides the perfect dining experience where concerts and other performances entertain residents. A second-floor balcony overlooks the first floor. The area is outfitted with games and puzzles, and comfortable seating where residents can gather and relax while also having open views of the common areas below. The interior design reflects the natural environment by incorporating natural colors. Sky blue accent walls and sand patterned carpet line the hallways. Stone and brick exterior materials are wrapped into the interior to enhance and unify the design with the exterior. Two-story natural stone columns outline the borders of the grand hall and the outside entryway. Individual apartments feature granite or quartz counters and bar seating as well as drop lighting. A unique feature is a special “bommer” hinge in the bathroom that allows doors to open either way with the flip of a switch in an emergency. That includes the Family History and Genealogy Center on the third floor. Open to the public, visitors can research their family roots at the center. Volunteers staff the center, which is equipped with computers and software to research family lineage online. 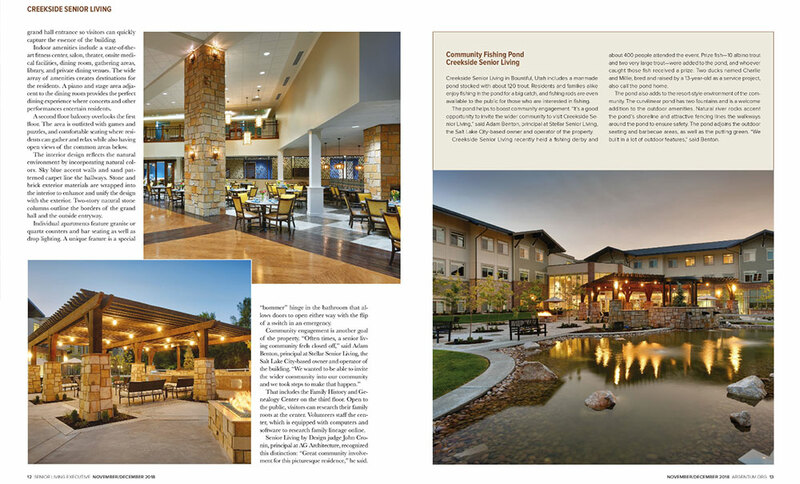 Senior Living by Design judge John Cronin, principal at AG Architecture, recognized this distinction: “Great community involvement for this picturesque residence,” he said. Creekside Senior Living in Bountiful, Utah includes a manmade pond stocked with about 120 trout. Residents and families alike enjoy fishing in the pond for a big catch, and fishing rods are even available to the public for those who are interested in fishing. The pond helps to boost community engagement. 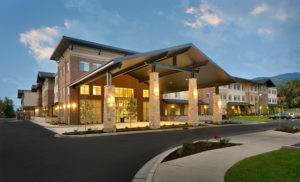 “It’s a good opportunity to invite the wider community to visit Creekside Senior Living,” said Adam Benton, principal at Stellar Senior Living, the Salt Lake City-based owner and operator of the property. Creekside Senior Living recently held a fishing derby and about 400 people attended the event. Prize fish–10 albino trout and two very large trout–were added to the pond, and whoever caught those fish received a prize. Two ducks named Charlie and Millie, bred and raised by a 13-year old as a service project, also call the pond home. The pond also adds to the resort-style environment of the community. The curvilinear pond has two fountains and is a welcome addition to the outdoor amenities. Natural river rocks accent the pond’s shoreline and attractive fencing lines the walkways around the pond to ensure safety. The pond adjoins the outdoor seating and barbecue areas, as well as the putting green. “We built in a lot of outdoor features,” said Benton.